One of my favorite things about the military is the pomp and circumstance...the ceremony. I believe a great attraction for young people to sign up for service is that if they perform and perform well, they will be rewarded with a promotion or a medal or both. For these GI's it is validation of a year of their lives spent elsewhere trying to make a difference even against all odds. 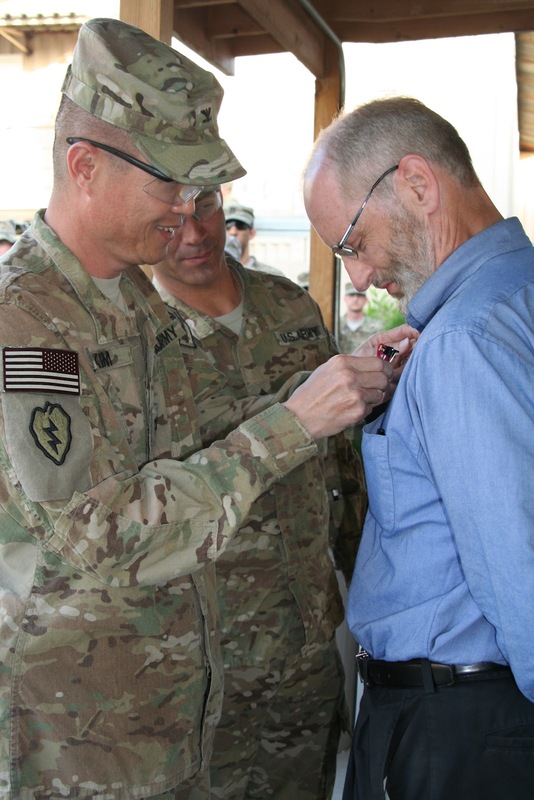 But other people on the FOB make a difference and are honored too with coins and medals. I can't show pictures of everyone, but there is a group called Human Terrain that strives to understand the culture and give insight to the military. Then there are the interpreters who risk their lives sneaking onto the FOB trying to make a difference in their country by doing what they believe makes a difference. And there is also the State Department. Here is a photo of Anna who has done some amazing work. On her right is CSM Spano and to her left is Col Kim of the 25th Division, Bronco's. One of Anna's projects, Teen Teach, shows how eager the Afghan children are to learn English. It was originally slated for 800 students, but almost 2000 showed up. This is really inspiring and gives you some insight into Jalalabad and the children there. Please watch this. Here is a picture of John, who actually received a medal for his fine work. He will be joining his family back in the states soon and looks forward to all living on one continent for a change. I know the State Department gets a bad rap especially with the release of the book: We Meant Well, but the people I met, really do mean well and want to help from the inside out. It's relentless work and dangerous, but the rewards they receive after a year or two or five, is only they hope they have made a difference. Perhaps one of the most profound things I realized on this trip is that, we are there to help a society to achieve their dreams and hopes and these achievements most likely will not be our vision of this success.